Stinson V177 Gullwing built in 1943 started life as a navigator trainer in Canada. After WW2 the airplane was surplus to military requirements and purchased by a Canadian pilot who flew it with no modifications until he sold it to an airplane restorer in California in 1975. The Gullwing was stripped of it's fabric and the tubular metal airframe inspected for corrosion. The fuselage was then recovered with fabric applied with ten layers of Allumnigrip. The 260 hp Lycoming radial engine was rebuilt. After two years work the Gullwing was flown to airshows in Arizona and California where it won awards in categories including best ex military, best prepared and many more awards. The airplane was called "Orion" and admired by many including Bill Lear . 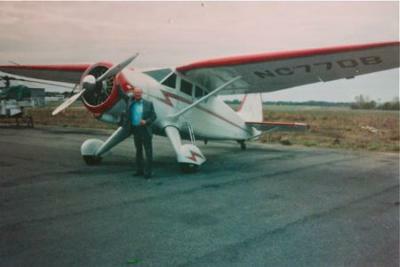 In 1989 the Stinson was sold to a French airline pilot living in Nantes France. Rather than risk damage crating the airplane it was decided to fly it across the Atlantic. I had ferried quite a number of aircraft across the Atlantic but the flights had been in small corporate jets and turbo props . Only once had I made a ferry flight solo in a single engine airplane. Flying the Gullwing across the Atlantic presented a few problems. It was the beginning of October and there was no cabin heating or pitot head heater. The Lycoming engine had a glove fitted around the cylinders directing warm air to the Stromberg carburetor in the case of carb. icing conditions. Rather against my better judgement I decided to take the ferry flight. The route from Van Nuys CA. to Bangor Maine was determined by the Stinson's endurance of four hours. A huge high pressure system dominated the central U.S. resulting in VFR conditions. The instrument panel consisted of basic flight instruments plus altitude indicator ADF and VOR, there was no transponder. At a steady 100 kts and refueling at Prestwick AZ, Las Vegas NM, Liberal and Olathe KA, I arrived at Du Page, Chicago where I had a mode C transponder installed and replaced the Bendix T12 ADF with a later model. After refueling at Elmira NY and Manchester NH, I landed at Bangor to have a 100 gallon ferry tank installed. Fuel from the ferry tank was fed directly to the engine by an electric pump. A second pump was fitted as a back up. The remainder of the ferry flight had to be filed as IFR required for trans oceanic flights. My route was to Sept Isle, Fort `Chimo (Kuujjaak),Frobisher Bay (Iqualit) across the Davis Straight to Sondrestrom Fjiord Greenland. It was mid October, winter had already arrived. Under my survival suit I had layers of clothing, sheepskin lined boots, silk gloves and a ski cap. I now had an 800 mile range but the airplane was heavy, giving a full throttle height of 11,000 feet. With only 2 NDBs between Sept Iles and Fort Chimo, I had to rely on DR navigation. Apart from Labrador City there is nothing but endless pine forest, lakes and rivers , nowhere to force land a fixed gear airplane. At 1850 rpm the Lycoming gave a comforting beat. At 4 1/2 hours flight time, I was unable to pick up the Fort Chimo NDB. After contacting Chimo, tower I told them I calculated I was 50 nms somewhere south of the airfield. They asked me if I could see a river. I was directly over a large river but on my chart there were at least four rivers running towards Ungava Bay. I could have been anywhere east of the airfield. Air traffic told me to fly north to the coast then follow the coast in an easterly direction to an inlet, and by following the inlet for 5 miles, I would be at the airport. Just as I was about to follow their directions the ADF needle steadied on the Chimu NDB. The evening temperature was minus 20 degrees C when I landed. I knew without pre heating the engine, it would never start the next morning. Luckily I saw two DHC Twin Otters in a hangar with plenty of extra space. For $100 I rented a space in the heated hangar for the night. After spending the night in the only hotel and enduring the noise of heavy drinking in the hotel bar, I took off early for Frobisher Bay on Baffin Island. Most of the route would be over water already with a film of ice. After three hours in good weather, I landed at Frobisher Bay international air port. A heated hangar cost me $200. Everything including hotels are very expensive in Frobisher. My next leg would be 250 nms over the Davis Straight to Sondrestrom at that time a USAF staging and rescue base. My attention during the flight to Greenland was focused on the oil pressure gauge and steady beat of the engine. I was carrying a four man life raft, but at water temperatures near to or below freezing, a water landing was hardly an option. Note: I will continue my account of "Orion" in a second installment. Here's Flight of the Orion Part 2 and don't miss the conclusion. We can't wait for the second installment! Any photos to put with the story? Thanks writing it.